thinking fast and slow | Blah! There aren’t many books I read that I would recommend that everyone read. 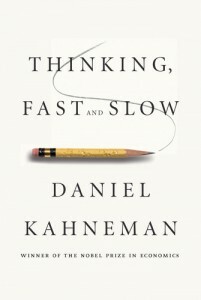 But Daniel Kahneman’s Thinking, Fast and Slow would be one. We all want to think we are rational agents, that we actively deliberate when we make a decision, that we think about the things we hear with a critical mind. In fact, much of so-called “classical” economics is built on just such an assumption of rational people. Kahneman, a Nobel prize winning economist known for his pioneering work on behavioral economics, demonstrates with example after example that we are far from such rational beings. Even worse, our brains essentially trick us into thinking we are rational. The decisions we make, the way we process information we see and hear, and our reactions to the world are all influenced much more than we realize by our subconscious mind. In fact, many decisions are made at the subconscious level and, only after the fact, does our conscious mind make up reasons for those decisions. That is, we create our own narratives that make our thinking self-consistent, that make our world view and our internal world make sense. 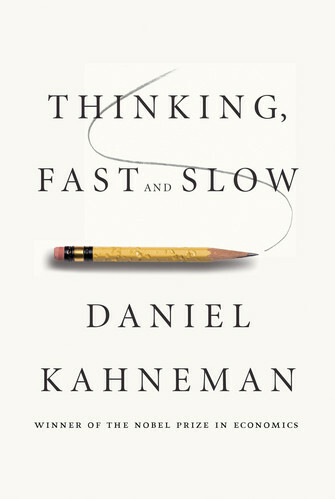 Kahneman has lead or been part of numerous studies that demonstrate how our brains process information and how we reach decisions and he describes some truly eye-opening and mind-opening examples. I won’t go into any of them here, for fear of getting them wrong, but needless to say they make one question exactly how rational and how in control of our own minds we really are. Do our thoughts and beliefs come from well-thought out origins, or are they the reaction of some deep part of our minds that we aren’t even aware of? How much do we really know ourselves? Lest one think that these are esoteric questions, Kahneman’s examples are real-world, showing how these kinds of subconscious mental processes influence pretty much every decision we make. He includes examples of how judges make decisions, how military training is conducted, and how we do simple things like how we interpret the world around us. The book is dense with a lot of concepts that Kahneman tries to dumb down for the average reader, but even so, some of these ideas take a few readings to absorb. I’ve only gone through the book once, but I certainly intend to revisit this book, probably multiple times. I would highly recommend this book to any and everyone. I think that it is with this kind of insight that we can build better economic and political systems that aren’t based on fallacious assumptions about the nature of human behavior. Once we all recognize how we really do think, we can maybe make an active choice to try to, in the end, be a bit more rational.